See that chair in the lower right hand corner? It's the Josephine chair from Ethan Allen. I popped into EA a couple of weeks ago to price it out. It was on sale. It was going to cost about $850 with the fabric I wanted. Okay... sounds great. I'll be back. Never. Isn't she pretty? I love the detail. She was a fraction of the cost of Josephine, and re-upholstery is only going to run $50... woo hoo!! I originally thought I'd upholster over the caning, but it's in good condition and I rather like it. I think this is the new fabric she'll be sporting soon. I've also started working on my corner china cabinets. I used Sherry's chalk paint recipe to create my own, and started painting the back of the shelves. I've got a long way to go, but I am loving the look so far. Area rug selection is underway! Thanks to Joni at Cote de Texas, I have decided to do a seagrass rug. If you are considering seagrass, you need to read Joni's post about it. She provides detailed information and great inspiration pictures. I've been reading and re-reading it, and studying the pictures. (Joni, if you've been wondering why a post you wrote over 2 years ago has had 20,000 views in the past week, now you know). Since there seems to be no local flooring company that carries seagrass, I will most likely have to order one online. I got these samples from theperfectrug.com. Has anyone ordered from them? I'm leaning towards the one in the upper right corner. Where there is progress, there are setbacks... or at least around here there are. Remember the grasscloth wallpaper in my dining room? Don't forget to enter my Shabby Apple Giveaway ... just in time for the holidays! Thanks for stopping by, and have a great afternoon!! What a fantastic find that chair is - love the caning as well. I totally agree the top right corner is the best carpet. The lower ones have too large a weave and the upper left is a bit too honey coloured. I think there must be a very sad, very bad tale behind the wallpaper that is not on the wall anymore. Boohoo! I love your living room design, by the way. I could live in a room like that too! Love that chair!! Lucky you. I order my seagrass rugs from Overstock.com. Cheap shipping and fast. The chair is perfect and it's going to look great dressed in that fabric. Yay! I order my rugs from Natural Area Rugs.com. They have a huge selection and you can pretty much customize the whole look. I have several of their rugs and am never disappointed! Wishing you and your family a wonderful Thanksgiving, Carolyn! PS...love the cabinet, the color is great! Love your design plan and that craigslist chair is AWESOME. What a find. Simply gorgeous. Thanks so much for sharing at DIYbyDesign Fall into Fall party. So glad you were able to find the chair! It's beautiful! I love Louis chairs! I know how it is to redo a family room. I just got finished repainting mine including an armoire. I did it all by myself so it took forever! I will post it soon. Looks like yours is much more involved. You're doing a total overhaul! I love the new chair you found and I really love the idea of using seagrass in there too. I have a seagrass area rug in mine and really love it. It goes with anything! Looking forward to seeing how everything turns out that you're working on. Your chair was a real find, and it will be even more gorgeous with your new fabric. Love the color that you are putting into your corner cabinet. You are going to love a seagrass rug. They add great texture to a room, but the best part is that they are indestructible. We have a large dog, 2 cats, and a husband that tracks in dirt. Carolyn, your chair is gorgeous! It has beautiful lines and details. What an amazing find! 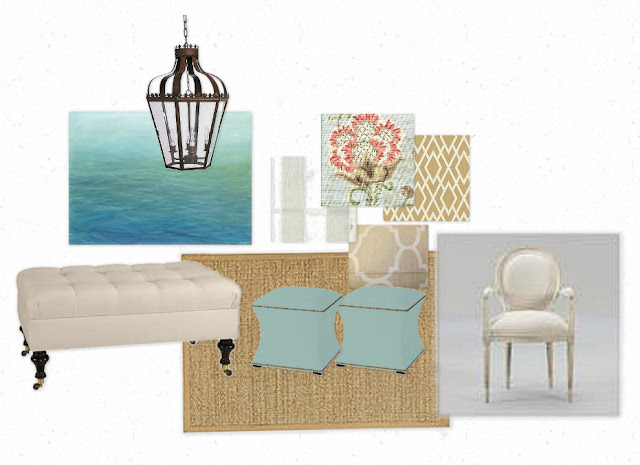 Your inspiration board is beautiful, and I'm looking forward to seeing your dining room when it's finished. Carolyn I am so envious of that pretty chair! It is sooo great. I love the fabric you chose for her. Great score! HA!.. the repo man came a took your grass cloth!... bless your heart. I ALMOST went with grass cloth the other day for the hall.. then I remembers that we have cats who claw EVERYTHING - slapped myself and decided to paint..
love the chair. great idea to skip the EA chair. I swear the fabric on your chair matches one on a flea market find I have. Also, I have the same corner cabinet and "fancy" brass chandelier. I just painted it oil rubbed bronze, much better but not my dream fixture but for $8, a huge improvement. Can't wait to see what else you do. Love how pretty your blog is! It's going to be beautiful. I just love the colors and your selections! As always, disconnect the electrical supply, both 12 volt and 110 volt, and turn off the LP gas before doing maintenance on the absorption refrigerator.. Snow wasn't the only white powder falling in Green Bay, Wisconsin, during the 2010 Christmas season. If you want to apply different rules to other source networks you should use the groups ACL tab. No, no, no Not to make it slippery, so he could check for leaks, really, I'm not kidding.